Cessna Aircraft Co. says its Citation Longitude will exceed initial performance targets and now has a range of 3,500 nautical miles, an increase of 100 nm, plus a full-fuel payload of 1,600 pounds, an increase of 100 pounds. Global fuel providers Avfuel and Air BP have formed a partnership that benefits the customers of both companies by increasing their worldwide general aviation footprints with new airport fuel supply locations for their respective contract fuel programs. Operators who lease their business aircraft often find that the amount of data consumed by passengers makes the lease unprofitable, or at least makes it difficult and time-consuming to recover the costs. Honeywell has created GoDirect Cabin Connectivity, a mobile app that helps the aircraft owner control data usage over satellite communications systems plus accomplish other tasks. ADS-B technology will help air traffic controllers to implement a new NASA system called “Flight Deck Interval Management,” which aims to make aircraft arrivals more efficient, NASA said this week. NASA now is planning a field test of the system early next year, above Seattle. The cockpit-based technology combines NASA-developed software with off-the-shelf hardware and connects the system to the aircraft’s onboard information and navigation systems. For such an expensive asset, even a busy personally flown aircraft doesn’t always get much utilization. And Daher, manufacturer of the TBM 900 and 930 single-engine turboprops, has come up with a promotional plan to help owners place their airplanes into charter operations, defraying the ownership costs and keeping the airplanes in the air more often than they otherwise might be. Two fatal midair crashes that took place in 2015 will be discussed at an NTSB hearing on November 15, the safety board said on Tuesday. At the hearing, the board will release its analytical findings, its determination of probable cause, and suggested safety improvements. The board posted its factual report this week from its investigation of a July 2015 collision between a Cessna 150M and a USAF Lockheed-Martin F-16CM in South Carolina. On Saturday, Oct. 29, 2016, the regular monthly membership meeting of EAA Chapter 534 was held at Bob White Field (X61) in Zellwood, Florida, instead of Leesburg International Airport, where the chapter is based. 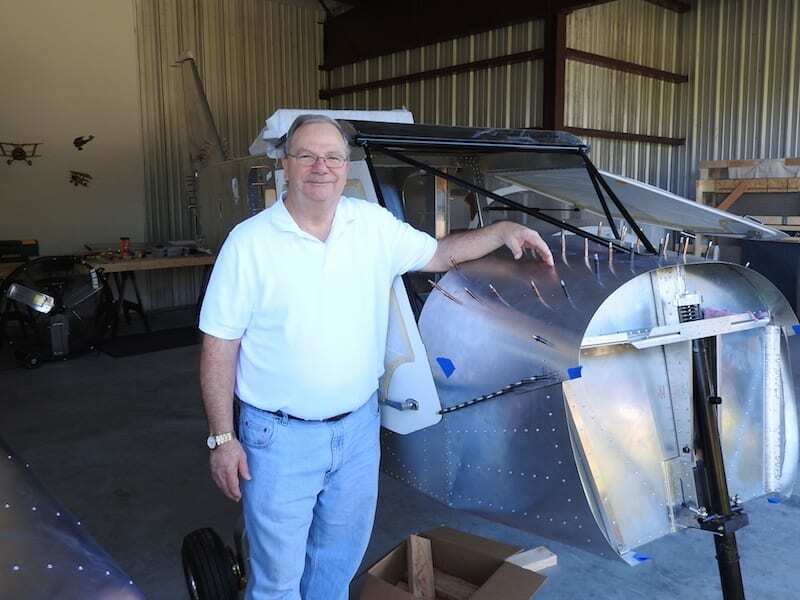 This gave chapter members a chance to take a look at a homebuild project of EAA Chapter 534 member John Minatelli, who recently moved his project from his home to a hangar at Bob White Field. 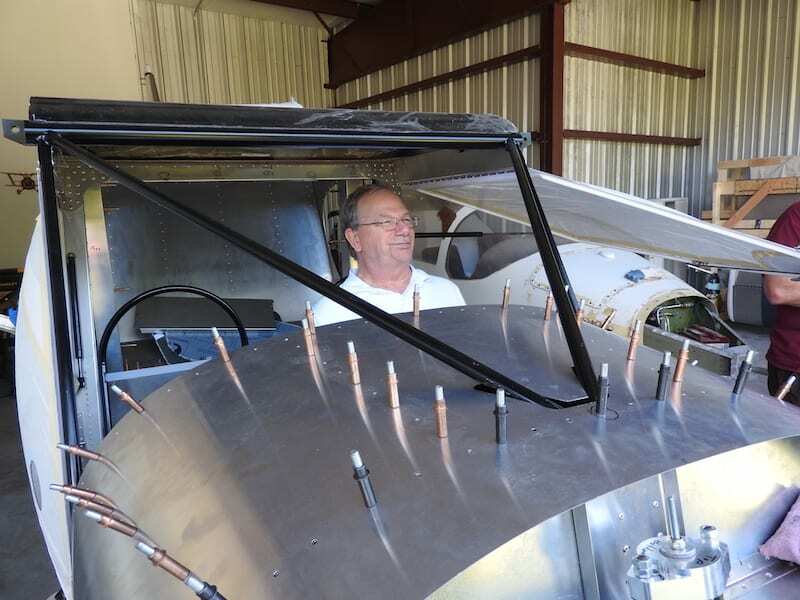 Airplane builder John Minatelli shows off his project, a Zenith 750 Cruzer at his hangar at the Bob White Field. He is building a Zenith 750 Cruzer, which will eventually use a Corvair six cylinder engine for its powerplant. He is pretty well along in the construction phase with around 600 building hours so far. Minatelli sits in his project Zenith 750 Cruzer while the rest of the members stand around making airplane sounds. He could close his eyes and visualize his future. This visit to Bob White Field coincided with a fly-in that the owner of the field, Pete Council, was having at the same time. 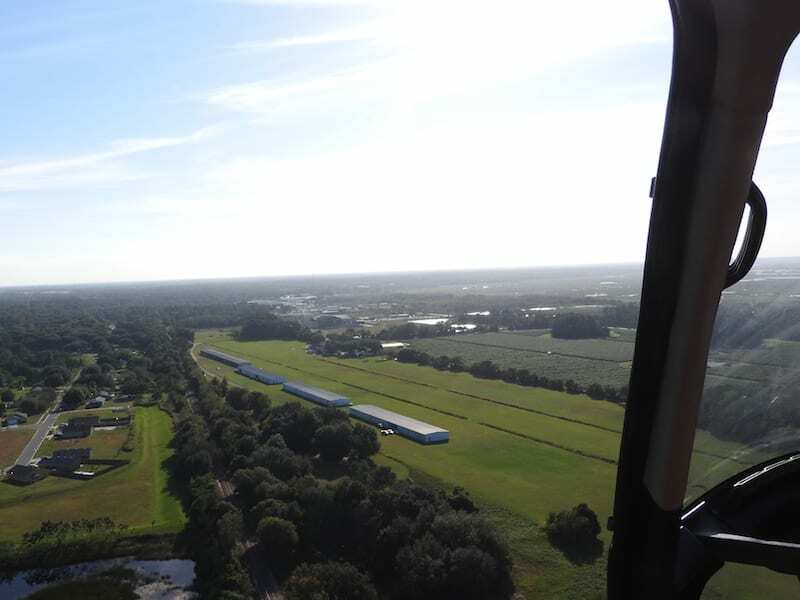 It was a beautiful day for flying as it was a typical sunny day in Florida with blue skies, moderate temperature and very little wind. 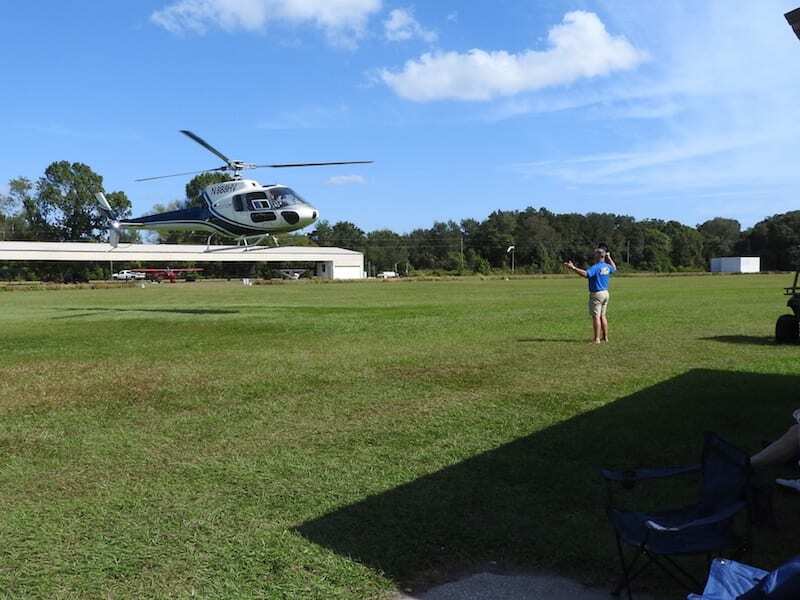 EAA Chapter 534 member Steve Barber assists chapter pilot Han Gunter-Vosseler to land his Eurocopter at the Bob White Fly-In. About 50 or so single engine aircraft of all types and vintages showed up to join in the festivities. They served a very nice lunch and had plenty of seating in a large hangar owned by Malcolm Powell of Southern Aircraft Support. 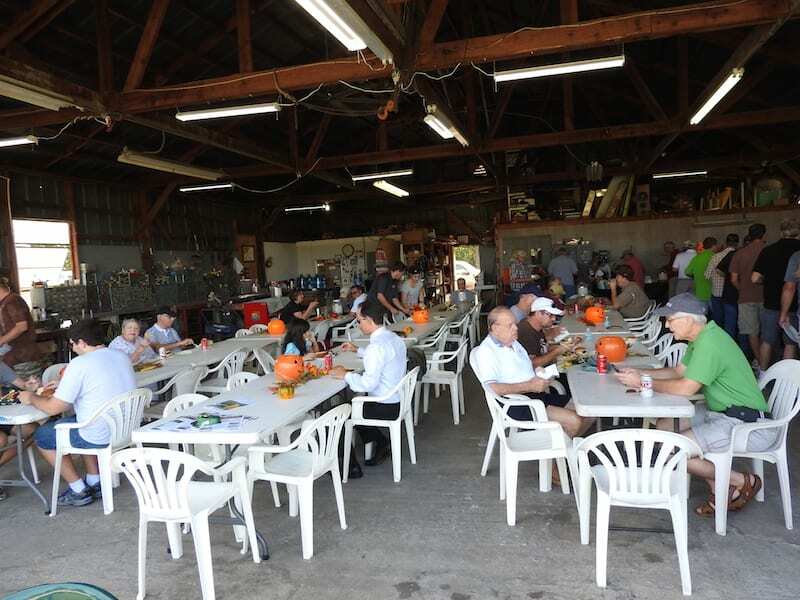 Malcolm Powell’s Southern Aircraft Support hangar provided plenty of room and table space for the fly-In lunch. 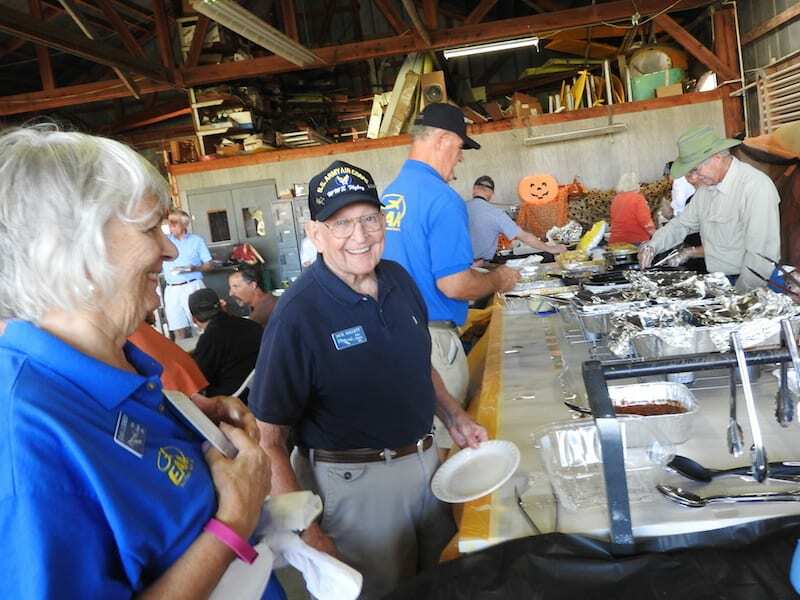 EAA Chapter 534 members Joan Luebbers, Jack Hallett and Steve Barber enjoyed the chow served at the Bob White Field Fly-In. 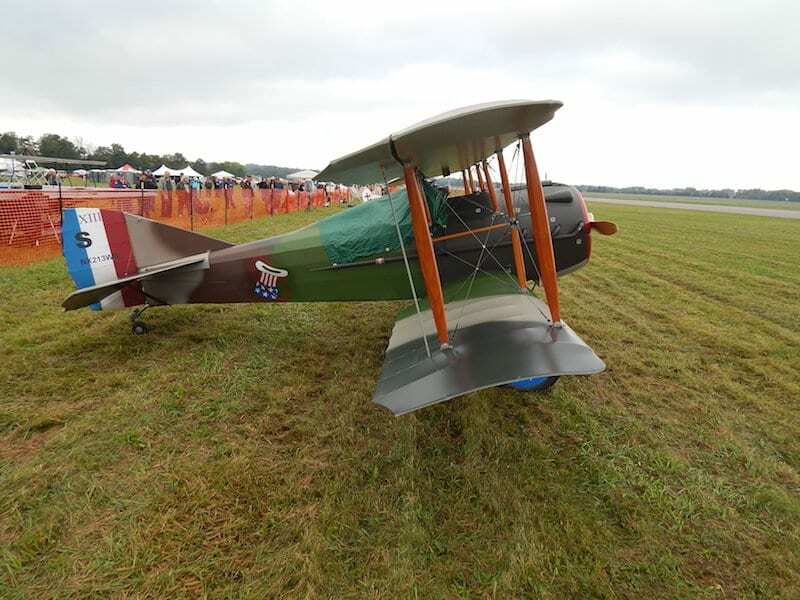 Hundreds of spectators gathered Oct. 1-2, 2016, on the grassy field along a seldom used runway in Dayton, Ohio, to watch World War I replica airplanes have mock dogfights as they flew overhead. The rat-tat-tat of machine gun fire could be heard over the loudspeakers as the airplanes approached the crowd overhead. 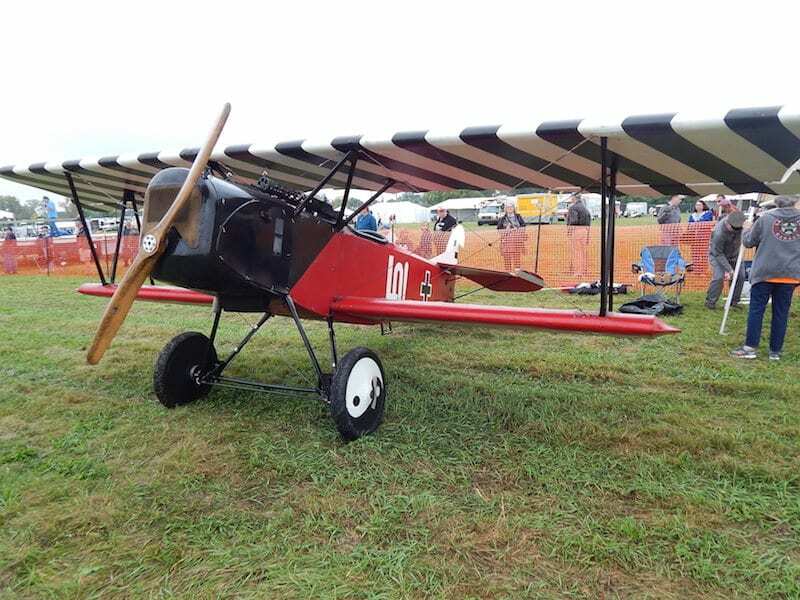 The replica airplanes were mostly hand-made by their owners of wood, painted fabric, and wire cables. The majority are 7/8 scale of the original size and included Fokker D-VIIs, Nieuports, SPADS, and a German Siemens-Schuckert D-1. A full-size restored original JN4 “Jenny” also was part of the event, one of seven Jennys still flying. 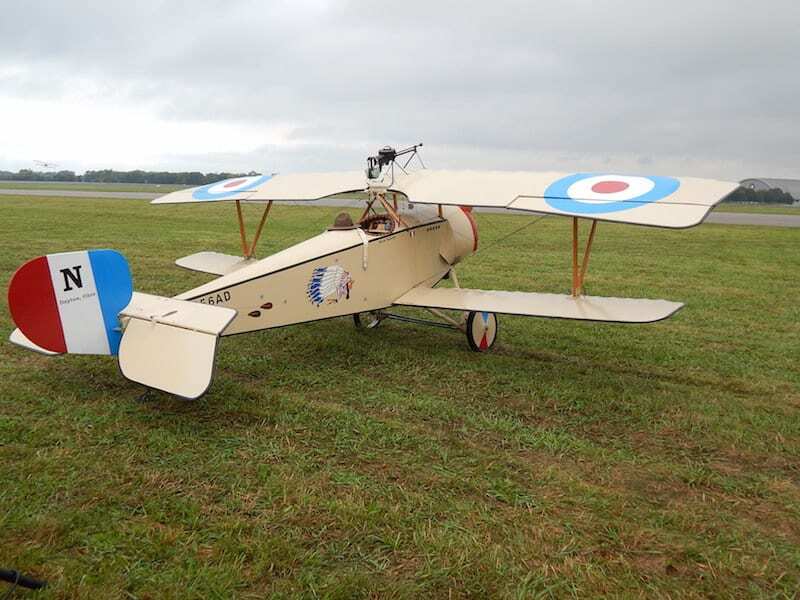 The exciting action was part of the World War I Dawn Patrol Rendezvous hosted by the National Museum of the United States Air Force and the Great War Aeroplanes Association. 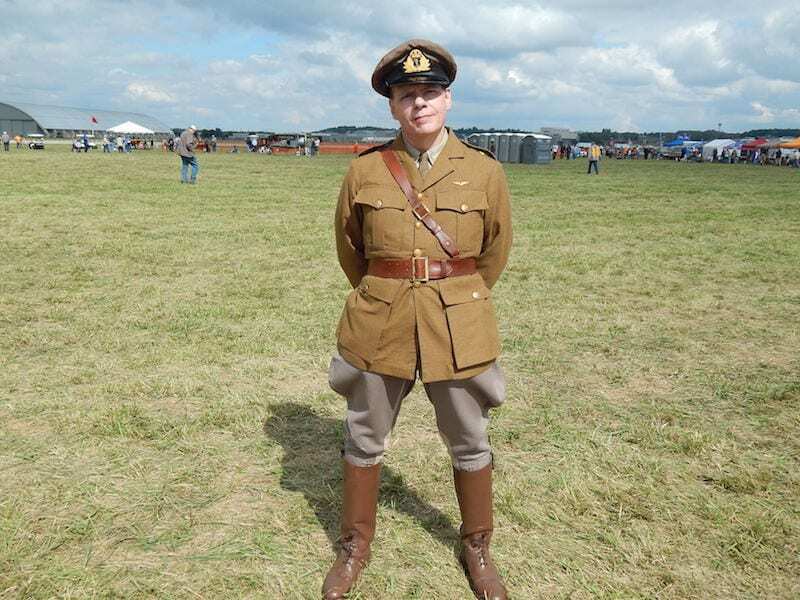 Unfortunately this year, the weather did not co-operate as it rained off and on both days. It caused attendance to be lower than expected and prevented some of the airplanes and autos from participating. About half of the expected 19 airplanes did not attend. 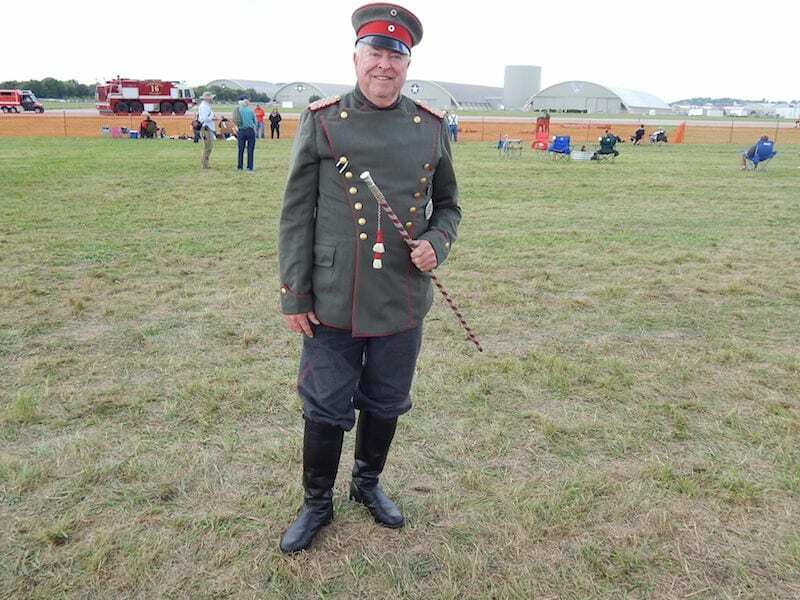 The occasion was part of the 100th anniversary of World War I, which began in 1914 and ended in 1918. Although World War I was mainly fought by European countries, the U.S. entered the war in April 1917. 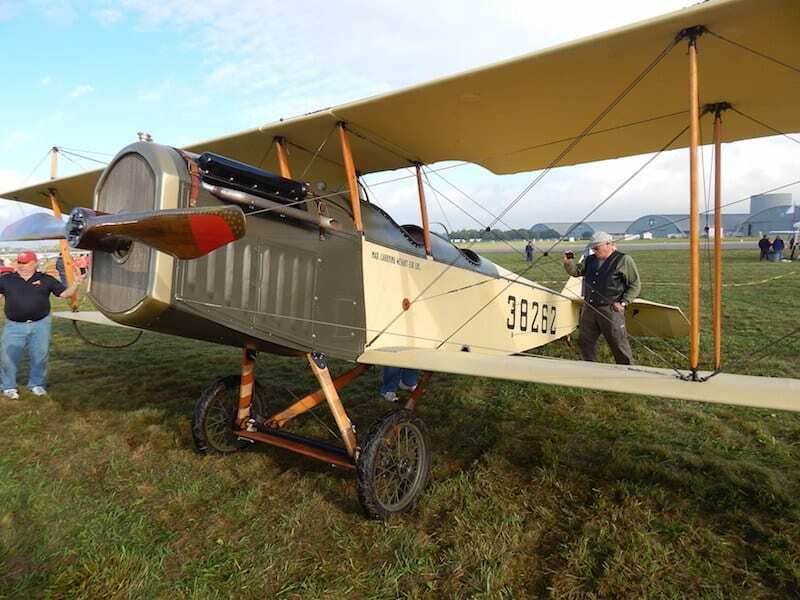 The last Dawn Patrol hosted by the museum was in September 2014. 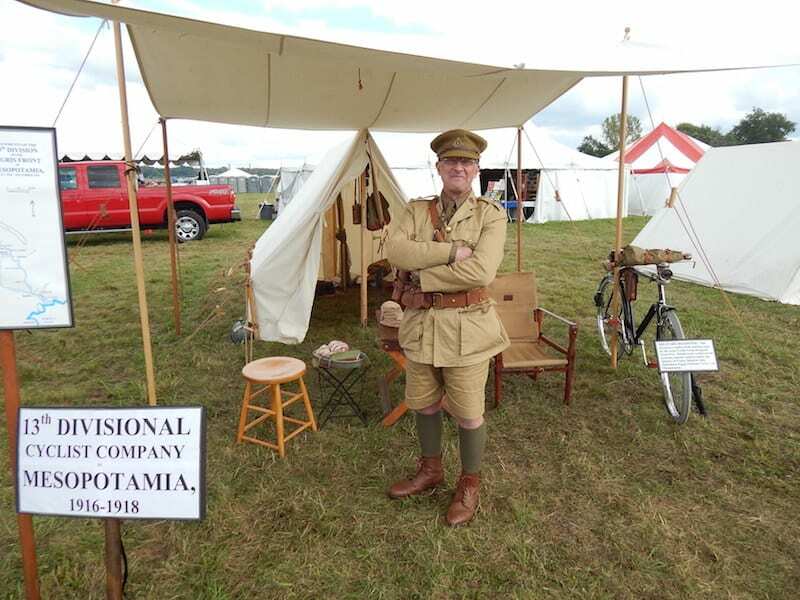 In 2013, the U.S. Congress established the World War I Centennial Commission to commemorate the 100th anniversary of the start of the war. 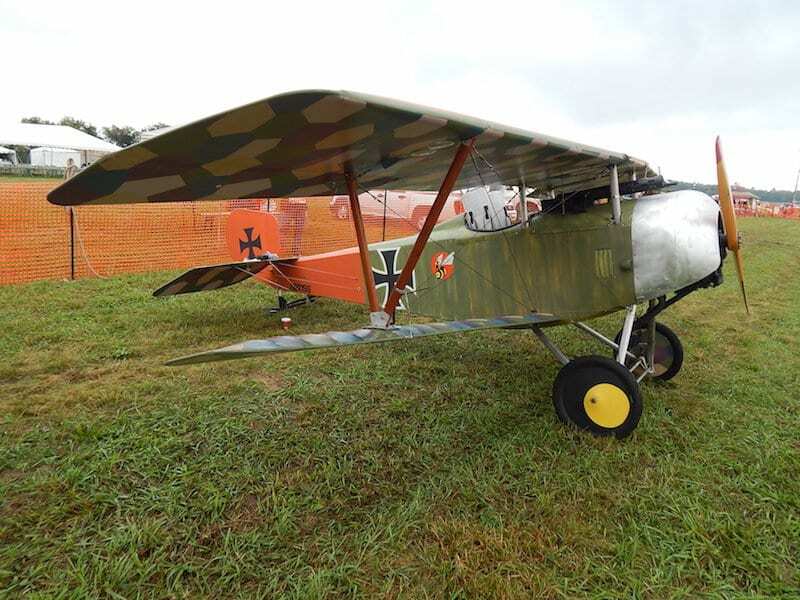 Fokker D-VII, 80% scale, markings of WW I German ace Ernst Udet, owner Mark Hymer, Owasso, Oklahoma. The term “Dawn Patrol” came from the practice of pilots taking off from airfields just before dawn so they would be in position to engage the enemy with the sun in their backs. This meant the enemy had difficulty spotting them with sun in their eyes. 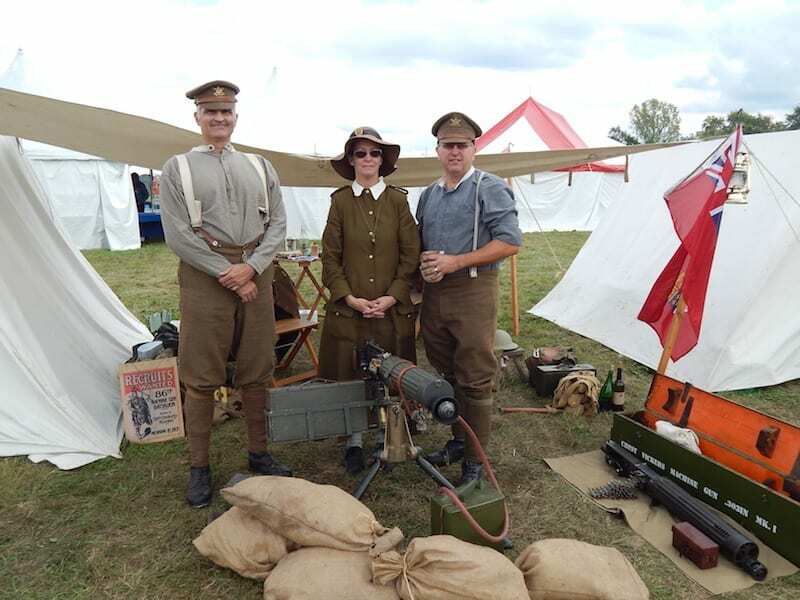 In addition to the excitement of the flying airplanes, the public had an opportunity to view various military campsites created by re-enactors who were dressed in the uniforms of German, Scottish, British, Australian, Canadian, and U.S. units. 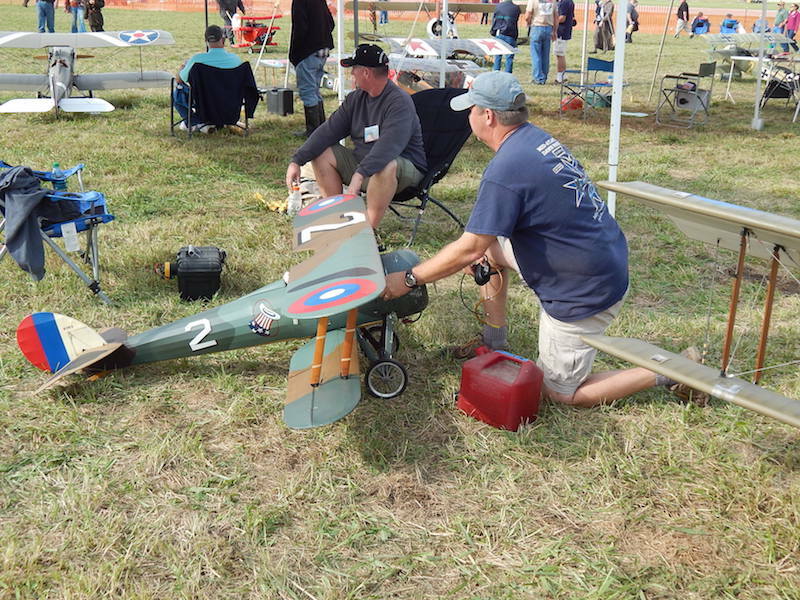 Besides old flying airplanes and realistic campsites, there was a large number of radio-controlled airplanes that filled the sky when the replica airplanes were on the ground for static display. From a distance the radio-controlled airplanes looked like the real ones. 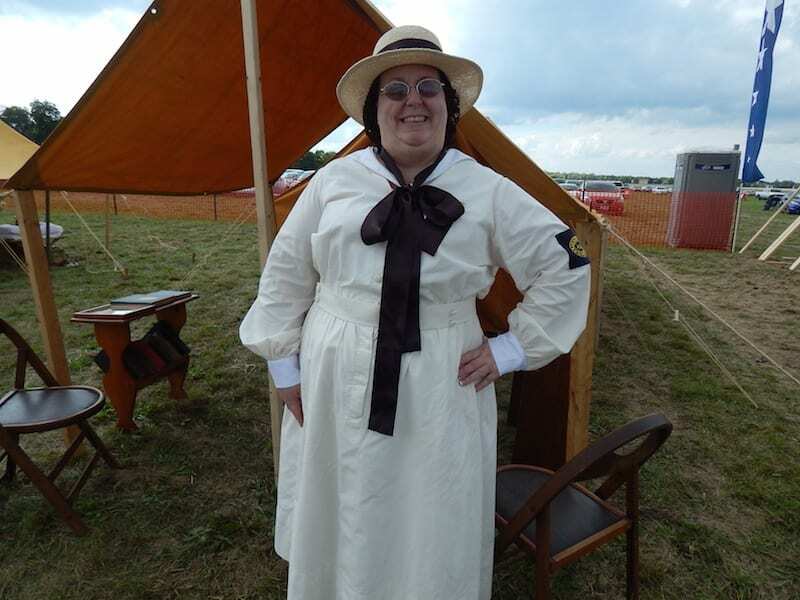 Parked in the center of the grassy field were six antique automobiles that were in beautiful condition. 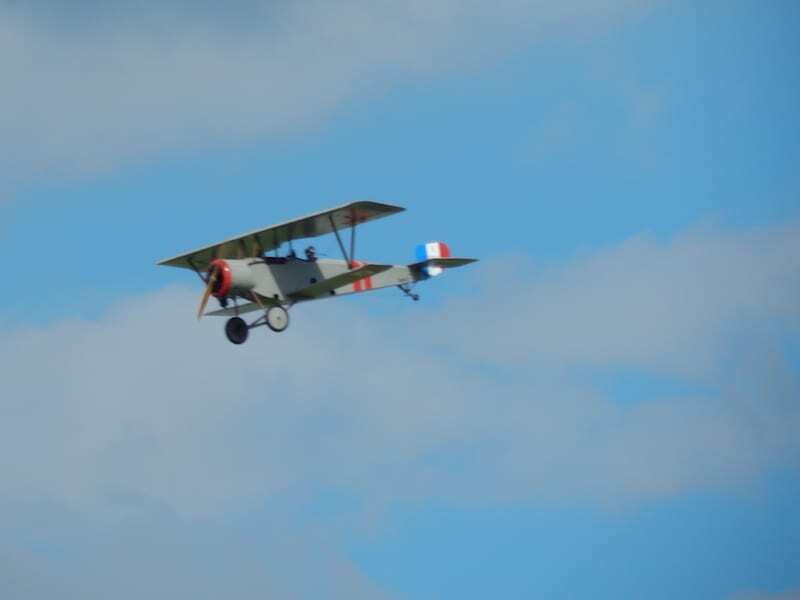 They were driven in tandum up and down the runway throughout the day by their owners dressed in period clothing. 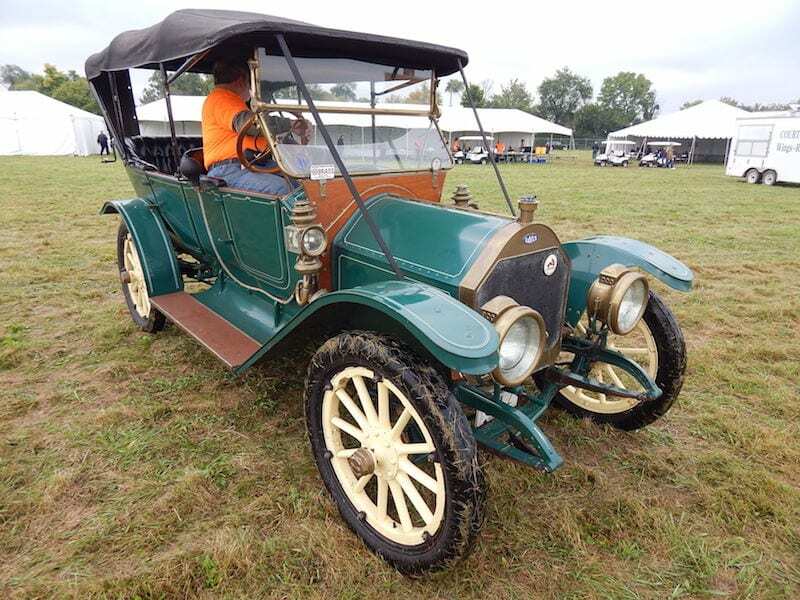 There were 10 antique automobiles scheduled, but due to the bad weather only six arrived. They were a 1912 Buick; a 1909 Maxwell; a 1911 Ford; a 1910 Buick; a 1912 McLaughlin; and a 1911 Davis. 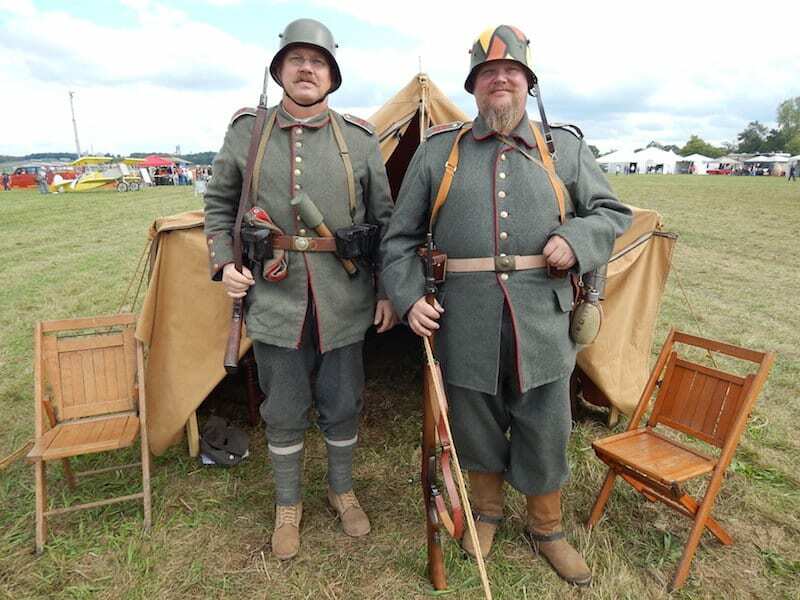 As with most large shows of this type, there were vendors selling all types of aviation memorabilia, and there were some unique exhibits, including an original Mercedes 6-cylinder aircraft engine complete with Spandau machine gun mounted on the back. 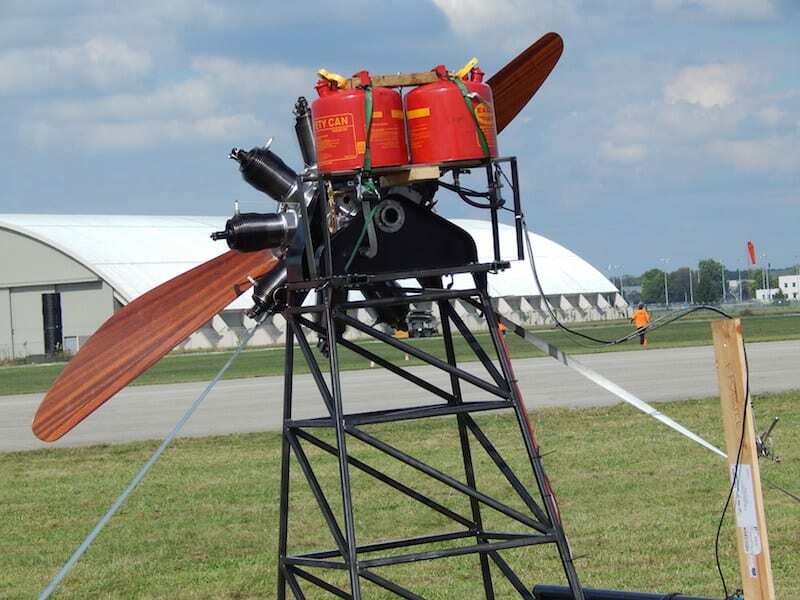 Original WW I rotary engine that was demonstrated working. One of only less than 10 original working engines left in the world. Another unique exhibit was an original World War I rotary engine on a stand. It was started several times during each day to show how it works. This engine had the cylinders turn around the crankshaft, which is opposite of most engines. This rotary engine is one of less than 10 original working rotary engines in the world. The next Dawn Patrol event will be in the fall of 2018 at the Air Force museum in Dayton. Beginning at 1 p.m., “D-Day 3D: Normandy 1944” tells the story of the largest Allied operation of World War II for the first time ever on a giant screen in 3D. This stunning film provides a new perspective to audiences of all ages of this monumental event that changed the world. Narrated by Tom Brokaw, the film pays tribute to those who gave their lives for our freedom… A duty of memory, a duty of gratitude. Audiences of all ages, including new generations, will discover from a new perspective how this landing changed the world. Exploring history, military strategy, science, technology and human values, the film will educate and appeal to all. A World War II veteran will speak to the audience after the film. Showing at 2:30 p.m., “Heroes on Deck: World War II on Lake Michigan” tells the story of forgotten World War II fighter planes at the bottom of Lake Michigan. Following the attack on Pearl Harbor, the U.S. Navy was desperate for aircraft carrier-qualified pilots. With enemy submarines patrolling both coasts, the radical decision was made to train pilots in the safety of Lake Michigan. Crashes and “water landings” often led to serious injuries and occasionally death. As a result, more than one hundred fighters and dive-bombers sank to the bottom of the lake. To date, more than 40 aircraft have been brought to the surface. Narrated by legendary CBS and A&E newsman Bill Kurtis, HEROES ON DECK captures some of the key recoveries and restoration efforts, and celebrates the stories of the brave pilots who survived this ingenious training operation. John Davies (Executive Producer/Writer/Director) will speak to the audience after the film. The final screening of the day takes place at 4:30 p.m. with “Flying the Feathered Edge: The Bob Hoover Project.” This screening is especially significant as Mr. Hoover passed away October 25th of this year at the age of 94. “Flying the Feathered Edge” chronicles his amazing 70 year-plus aviation career in vivid style, with rare footage, archival images, and interviews with Mr. Hoover and fellow legends of aviation like Burt Rutan, Gene Cernan, Bud Day, Sean D. Tucker, Clay Lacy and many others. Mr. Hoover began flying as an Air Corps fighter pilot during WWII. Shot down to become a POW, he ultimately made a daring escape to Allied territory in a stolen German fighter. Soon after, he began his test-flying career at Dayton’s Wright Field, instrumental in the transition from piston power to supersonic jet aircraft. He later launched an air show career that saw him perform in front of more people, in more countries, in more aircraft, than any individual before or since. Mr. Hoover influenced generations of pilots with his precision flying and gentlemanly demeanor. No speaker will follow this screening. The theatre’s Living History Film Series brings aviation history alive through films and guest speakers. The Living History Film Series is sponsored by the Boeing Co. and Texas Road House. Holiday Inn Dayton-Fairborn is the official hotel partner for the series. Tickets are available at the theatre’s ticket counter or by emailing theatre@afmuseum.com. The Salute to Heroes pass is available for only $25.00 and includes a ticket for each screening. Individual tickets for “D-Day 3D: Normandy 1944,” “Heroes on Deck: World War II on Lake Michigan,” and “Flying the Feathered Edge: The Bob Hoover Project” are only $8, $10 and $15 respectively. The Air Force Museum Theatre is operated by the Air Force Museum Foundation, Inc., a Section 501(c)(3) private, non-profit organization that assists the Air Force in the development and expansion of the facilities of the National Museum of the United States Air Force. For more information on the Air Force Museum Foundation, visit http://www.afmuseum.com. The Air Force Museum Foundation is not part of the Department of Defense or any of its components and it has no governmental status.